There is no doubt that the partition of India and Pakistan, which happened primarily on the basis of religion, has left some bitter memories in the minds of members of both these countries who once lived together amidst happiness and harmony. Over the years, quite a lot has been said and written on the adverse effects that the partition has caused to the people of both these lands. But unfortunately, the mainstream writings have not mentioned too much on the community that bore the most brunt of this colossal tragedy. And, the community that bore the brunt most was the community that had members belonging to both, Hinduism and Islam. The Sindhi community, members who belong to the land of Sindh, got separated amongst themselves as much as members of the entire United India. Sindhi Muslims were allowed to stay back in their homeland Sindh which was part of the newly formed Pakistan, obviously on the terms of religion, while Sindhi Hindus were compelled to leave their cherished homeland and their culture and past because of their religion. Circumstances soon drove the entire Sindhi Hindu community from their cherished homeland and they reached the confines of India in search of a new settlement. The partition of 1947, which resulted in the subsequent uprooting, migration and scattering of the Sindhi Hindu community throughout the globe, also led to the younger generation of the community becoming ignorant of their glorious past, glittering culture, colourful civilization and their roots. It has become imperative, now more than ever, for the older generation to educate the members of the younger generation on their history, language and rich culture and help them to compare it with different civilizations through historical perspective and understand their true identity. 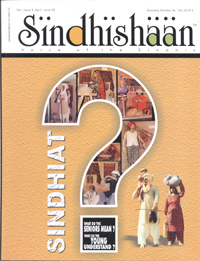 Sindhishaan through a series of articles aims at passing on such information on the glory of the Sindhi culture, history and traditions. In this write-up, Prem Matlani explores and takes you through the charm of the district of Larkana, once the home to many Sindhi Hindus. Larkana, popularly known as the Eden of Sindh due to its lush greenery, has always remained in the forefront of Western India (presently Pakistan). The Larkanaites have proved their mettle in diverse fields, such as politics, literature, business and social services. The ruins of Mohan-jo-daro or Jhukar-jo-daro, which is considered to be amongst the foremost civilizations of mankind, also come within the confines of the district of Larkana. One of the highlights of this ancient civilization is that even 5000 years back, there used to be covered underground drainage, highclass city planning, water distribution and health systems, which even as of today, seem a distant dream in many cities of India and Pakistan. One of the tragic tales of this civilization is the disappearance of its history, right from the advent of the Aryans in the Indus valley till the days of the destruction of the Mohan-jo-Daro. Larkana, situated 27 kms off Mohan-jo-Daro, has always been known for its affluence and since time immemorial has attracted different tribes from various parts of Sindh. In the 1700s, Shahal Mohammad Kalhoro constructed a water canal (Ghaar Wah) through the city and planted trees of different fruits on its either sides. It is also said that the city got its name from the fisherman of Laar (a part of lower Sindh) who settled in this area and were known as Laraks. Thus it came to known as Larkana. The city of Larkana progressed at a rapid pace during the latter days of the rule of the Talpur Mirs and then subsequently under the British rule, especially after being detached from the limits of Shikarpur and recognized as a separate district on August 1, 1901. The city, ever since has witnessed planned growth. Divided by a railway line, the city of Larkana houses the government offices, bungalows of senior officers and a host of multilane roads in the western parts, while the eastern parts houses the Ghaar Waah (canal) and grand bridge constructed over it, near Jiles Bazaar. In the earlier days much of the city’s transportation took place through the mode of waterways with the result that the city remained neat, clean and devoid of any modern day pollution. The world famous Britannica Encyclopedia defines Larkana as a ‘City of gardens’. This city of gardens is also known by different names such as, ‘Eden of Sindh’, ‘Shiraz of Sindh’ or ‘Baag-e-Erum’. There are many quotes which over the years have been used to describe the grandeur and magnificence of Larkana, such as ‘Hujei naano tag hum Larkano’ (Have money, visit Larkana), or ‘Larkano Saah Sebano, Mashooqan jo Makan, Aashiqn jo Aastan’ (Larkana, which is lovelier than oneself is haven for all lovers). One of the jewels in the crown of Larkana is the Gian Bagh, a beautiful garden constructed by none other than Diwan Gianchand Chandumal Motwani, who belonged to Larkana and was renowned for his “MOTWANI CHICAGO” electronic shop at Mumbai. Due to his regular visits to Bombay and Pune in the days prior to partition, he brought different varieties of flowers and vegetations from Pune and planted them at the Gian Bagh. Apart from Gian Bagh, Larkana is also known for the famous Tajar Bagh, constructed during the rule of the Kalhora Empire. This garden still houses the historical monument ‘Tajar’, abuilding which has got earthen pitcher pots place upside down on its terrace to keep it cool even during scorching heat of summer days. Fortunately or unfortunately, it has been eminent in our countries to change the names of such historical monuments to please the current-day politicians. Thus Tajar Bagh was renamed as Jinnah Bagh after Pakistan’s father of the nation, Mohammad Ali Jinnah and Gian Bagh was rechristened to Bagh-e-Zulifqar. Jinnah Bagh or Tajar Bagh is situtated on a vast piece of land in the centre of the town. Apart from the famous Tajar Bagh and Gian Bagh, the gardens of Larkana also included Karma Bagh, Raili Bagh Dharmi Bagh, Thanwar Bagh, Tolani Bagh, Baye to Bagh, Lekhraj Bagh, Lahori Bagh etc. At present only Karma Bagh and Riali Bagh are left, while the others have disappeared somewhere in the pages of history. Another important garden in this town was the Bolus Bagh situated in the heart of the city, housing a grand tower with clock, which was later converted into a commercial centre named after President Kennedy by the then foreign minister of Pakistan, Zulifqar Ali Bhutto. Prior to partition, Larkana was peace-personified. Hindus and Muslims lived together in complete peace and harmony. Despite the wide educational and economic gulf between the two communities, there was never a semblance of bitterness in their relations. Members of both the communities used to partake in each other’s festivities. The entire city of Larkana glittered like a newly wed bride on the night of Diwali. The Suko-Talao always witnessed a sea of humanity converging on it to celebrated the demise of the demon king, Ravana on Dassera day. Nowadays, Suko-Talao is just like any other neighbourhood, housing many dwellings. On the banks of the Ghaar Waah, there exists the Jiles Bazaar, which was primarily a vegetable market. To its south, is the Siddiq Bazaar and the Shahi Bazaar which branches into the Sornarki Bazaar (Jewellery market), Khattan Bazaar (Pickle market), etc. The Shahi Bazaar ends in Lahori Bazaar (Iron market) and from there starts Ginza of Larkana i.e. Seoo Bazaar. In those days, the wealthy Zamindars of Larkana used to organize animal fights on festive days as means of celebration and for providing entertainment to the subjects. Normally hordes of well-bred dogs were unleashed on a pig, which had to not only defend itself from the dogs, but also attack them. These combats were terrifying spectacles. Coinciding with the elevation of one of the great sons of Larkana, Zulifqar Ali Bhutto as the head of the state of Pakistan on December 20, 1971, the city too became a cynosure of political and social activities. During his tenure, many a great leader, such as the Emperor of Iran, Reza Shah Pehelvi, Shaikh Zeid bin Sultan Alnahyan, the President of UAE, Chairman of the Palestinian Authority Yasser Arafat and many others, visited the city of Larkana. Once, under his tenure, a grand meeting of all the diplomatic heads of foreign missions in Pakistan was held in Larkana. The entire city was decorated with lights and its unmatched glitter got someone to describe it as ‘Uroos-al-balad’ (bride among the cities). The opposition raised a hue and cry that Prime Minsiter Bhutto was spending heavily in converting Larkana into Paris, but the late PM silenced his critics in the National Assembly (Lower House of Pakistan Parliament) by stating that Paris of only 300 years of history can never match the greatness of Larkana, which can boast of 5000 years old civilization. Such was his love for his hometown. Larkana is also known for its two world-class towers, namely Sukarno Memorial and Kamal-Ata-Turk Memorial, both of which are erected on the busy intersection of the city. The city railway station was further reconstructed into a grand new building. The airport of Mohan-Jo-Daro was further upgraded. Prime Minister Bhutto was extremely keen on providing the city of Larkana and its people with all amenities and the best of health facilities. Not only did he build many hospitals, he was also keen on building a top rank medical university. But destiny had other things in store for him, as in mid 1977 he was overthrown by military rule. Later on his daughter Benazir Bhutto also became Prime Minister of Pakistan in 1988 and 1993. During her days she established the Larkana Radio station in Ratodero and the Mohan-jo-Daro airport was upgraded to an International airport. Unfortunately, she could never complete a full tenure as Prime Minister and the city of Larkana and its boulevards are waiting for another such savior to come to its rescue and restore its pristine glory!! !